We* gave Jesus, the son of Mary, Clear (Signs) and strengthened him with the Holy Spirit. To Jesus, the son of Mary, We* gave Clear (Signs), and strengthened him with the Holy Spirit. [4.171] O People of the Book! Commit no excesses in your religion: nor say of Allah aught but the truth. And a Spirit proceeding from Him. [5.110] Then will Allah say: O Jesus the son of Mary! Recount My favour to thee and to thy mother. Behold! I strengthened thee with the Holy Spirit, so that thou didst speak to the people in childhood and in maturity. In order to strengthen those who believe and as a Guide and Glad Tidings to Muslims. To thy heart and mind, that thou mayest admonish in the perspicuous Arabic tongue. Without doubt it is (announced) in the Revealed Books of the former peoples. 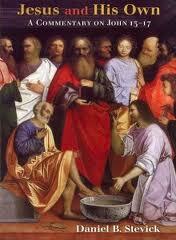 [32.9] But he fashioned him in due proportion, and breathed into him something of His spirit. And He gave you (the facilities of) hearing and sight and feeling (and understanding): Little thanks do ye give! [38.72] When I fashioned him (in due proportion) and breathed into him of My spirit*, fall ye down in obeisance unto him. [66:12] And Mary, Imran's daughter, who guarded her virginity, so We* breathed into her of Our Spirit*, and she confirmed the Words of her Lord and His Books, and became one of the obedient. [21:107] And We* did not send you (O Muhammad) except as a mercy to the world." [15:85] We* created not the heavens, the earth, and all between them, but for just ends. And the Hour is surely coming"
[15:9] We* have, without doubt, sent down the Message; and We* will assuredly guard it (from corruption)." And to Us* is the Final Goal. [37:171-177] Already has Our* Word been passed before (this) to Our* Servants sent (by Us). That they would certainly be assisted. And that Our* forces, they surely must conquer. So turn thou away from them for a little while. And watch them (how they fare), and they soon shall see. Do they wish (indeed) to hurry on our Punishment? But when it descends into the open space before them, evil will be the morning for those who were warned (and heeded not). "God was not booming clear instructions from on high. The divine voice constantly changed the way it referred to itself—as "we," "he," "your lord," "Allah" or "I"—shifting its relationship to both the Prophet and his audience. Nor was God distinctively male. Each recitation began with the invocation: "In the name of Allah, the Compassionate ('al-Rahman') and the Merciful ('al-Rahim')." Allah was a masculine noun, but the divine names al-Rahman and al-Rahim are not only grammatically feminine but related etymologically to the word for womb." Even though Jews and Muslims both find the Christian doctrines of the Trinity and Incarnation almost blasphemous, they have produced their own versions of these controversial theologies. 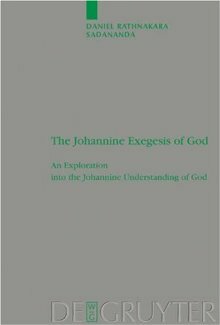 Each expression of these universal themes is slightly different, however, showing the ingenuity and inventiveness of the human imagination as it struggles to express its sense of God." Because this is such a big subject, I have deliberately confined myself to the One God worshipped by Jews, Christians and Muslims, though I have occasionally considered pagan, Hindu and Buddhist conceptions of ultimate reality to make a monotheistic point clearer. It seems that the idea of God is remarkably close to the ideas in religions that developed quite independently. . . . Mystics have seen God incarnated in a woman, for example. 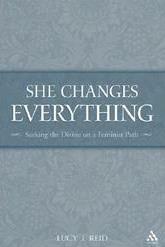 Others reverently speak of God's sexuality and have introduced a female element into the divine. This brings me to a difficult point. 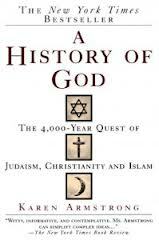 Because this God began as a specifically male deity, monotheists have usually referred to it as he." In recent years, feminists have understandably objected to this. . . . Yet it is perhaps worth mentioning that the masculine tenor of God-talk is particularly problematic in English. 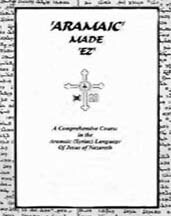 In Hebrew, Arabic and French, however, grammatical gender gives theological discourse a sort of sexual counterpoint and dialectic, which provides a balance that is often lacking in English. Thus in Arabic al-Lah (the supreme name for God) is grammatically masculine, but the word for the divine and inscrutable essence of God—al-Dhat—is feminine." Karen Armstrong, A History of God, Ballantine Books, 1993, p. xxi-xxiii. "It is true that there is plenty of material in the Koran that is more egalitarian than the western Christian tradition, which was heavily influenced by the misogyny of Greek thought. Perhaps the most fundamental is that the Islamic God does not have a gender. Arabic may refer to him by use of the male pronoun, but he is never described as "father" or "lord" as he is in the Judaeo-Christian tradition. Indeed, the Islamic God has characteristics that are expressly feminine; one of his most important "names" is al-Rahman (the All-Compassionate) from the Arabic rahma, which comes from the word rahim, meaning womb. In Islamic mysticism, the divinely beloved is female." 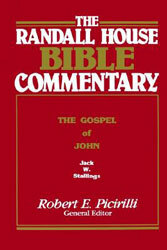 "Jesus therefore predicts that God will later send a human being to Earth to take up the role defined by John .i.e. to be a prophet who hears God's words and repeats his message to man." "And when Jesus foreannounced another Comforter, He must have intended a Person as distinct and helpful as He had been." "The Paraclete has a twofold function: to communicate Christ to believers and, to put the world on trial"
"But She—the Spirit, the Paraclete...—will teach you everything." 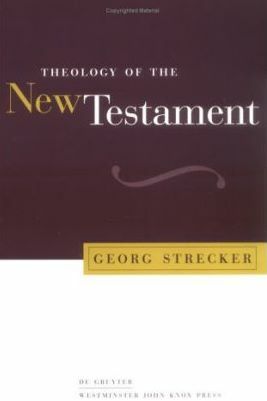 "Grammatical nonsense but evidence of the theological desire to defeminize the Divine." 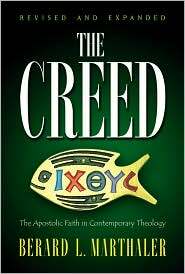 "The functions of the Paraclete spelled out in verses 13-15... are all acts of open and bold speaking in the highest degree." "The reaction of the world to the Paraclete will be much the same as the world's reaction was to Jesus." 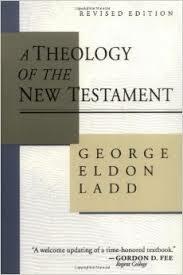 Bultmann calls the "coming of the Redeemer an 'eschatological event,' 'the turning-point of the ages." "The Paraclete equated with the Holy Spirit, is the only mediator of the word of the exalted Christ." 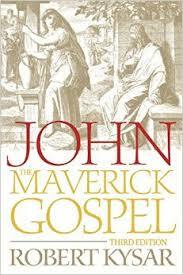 "The divine Paraclete, and no lessor agency, must show the world how wrong it was about him who was in the right." 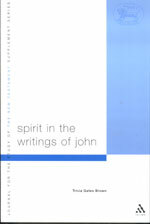 Stephen Smalley asserts that "the Spirit-Paraclete ... in John's Gospel is understood as personal, indeed, as a person." "The Messiah will come and the great age of salvation will dawn (for the pious)"
"The remembrance is to relive and re-enact the Christ event, to bring about new eschatological decision in time and space." "The Spirit acts in such an international situation as the revealer of 'judgment' on the powers that rule the world." The Paraclete's "appearance means that sin, righteousness, and judgment will be revealed." 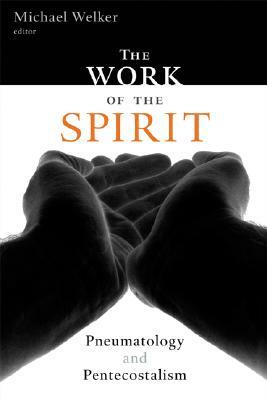 "While the Spirit-Paraclete is the true broker, the brokers they rely on are impostors." 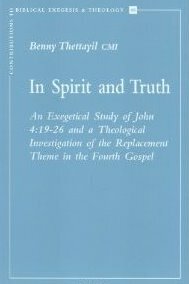 "The pneumatological activity ... of the Paraclete ... may most helpfully be considered in terms of the salvific working of the hidden Spirit." "The pneuma is the peculiar power by which the word becomes the words of eternal life." 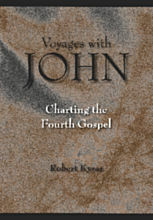 "The gift of peace, therefore, is intimately associated with the gift of the Spirit-Paraclete"
"This utopian hope, even when modestly expressed, links Jesus and the prophets to a much wider history of human longing." "Because of the presence of the Paraclete in the life of the believer, the blessings of the end-times—the eschaton—are already present"
"They are going, by the Holy Spirit's power, to be part of the greatest miracle of all, bringing men to salvation." 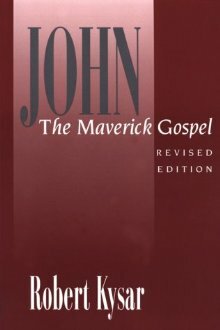 "The Kingdom of God stands as a comprehensive term for all that the messianic salvation included... is something to be sought here and now (Mt. 6:33) and to be received as children receive a gift (Mk. 10:15 = Lk. 18:16-17)." The Primordial Mother was the Primordial Power of Divine Love. The Power of God separated from God itself. God was the Witness — Witness of the Play of the Divine Power. There is no difference between the Two. God Almighty and His Power are just like the sun and his rays. For us, for human beings it is impossible to conceive the mystery. Moreover, in our ego, we think we can understand Him." Surah 17:85 "They Ask You Concerning The Spirit"
The Qur'an confirms that little knowledge is given to the Muslims concerning His Ruh (Holy Spirit or Adi Shakti). Allah had already revealed that the Trinity was a false conjectured doctrine. Any attempt to explain His Ruh would have only confused the illiterate desert dwellers, and even smack of hypocrisy and falsehood as "there were quite a number of idols or gods worshipped among the Arabs, and sura 71.23 bears witness to this. There is also that surprisingly frank account in the Qur'an of the occasion when the Prophet apparently made somewhat of a concession to paganism in reciting sura 53.19-20 concerning Al-Lat, Al-'Uzza and Manat, the goddesses of the Sun, of Venus and of Fate respectively. . . However, it is obvious that idolatry was rife at the time of Muhammad. He was not going to have an easy time convincing his people of the existence of one true God. Worship of Al-Lat was extremely widespread, and her means "the goddess." "
According to K. W. Morgan, Islam: The Straight Path, "In the time of the Prophet the people of Mecca and of Arabia were known as the meanest of all in bahavior. One need only recall their gods. They made statues of stone and wood, and them worshipped them by asking for material things. Robbery, murder, plunder, burying their newborn daughter alive, fighting over tribal affairs, doing cruel things to weak and harmless people—these were among their daily practices. Women were used for making money in an immoral way, and they had no rights at all. Immoral deeds were so much a part of their life that they boasted of their behavior. In such a situation the Prophet of Islam arose to guide the people." Thus whatever was revealed of the Spirit of Allah to Prophet Muhammad was the barest minimum in order to contain a volatile situation. But the fact remains that Allah made it a point to mention His Spirit without revealing anything about it's nature. This seemingly frivolous act 14 centuries ago today burst forth in all splendor as His Ruh proclaims and explains Al-Qiyamah to all humankind. The little information 1400 years ago is now an Oasis of Knowledge for all Believers to drink. The Holy Qur'an, an indisputable revealed book, literally breathes with precise prophecies and fulfilled promises for all His children of various traditions. 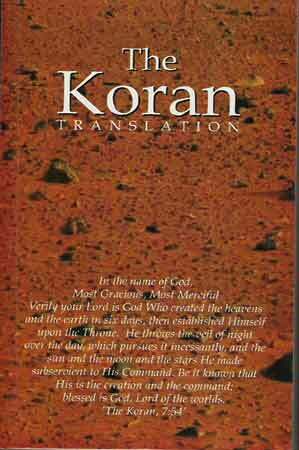 The Qur'an uses two terms "Ruh-Allah" and "Ar-Ruh-Al-Qudus" for the Spirit of God. Such is the case in the following references: "We gave unto Jesus, son of Mary, clear proofs [of Allah's sovereignty], and we supported him with the Holy Spirit [ar-Ruh-al Qudus]," (Surah 2, Al-Baqarah, The Cow: 87). "When Allah saith: O Jesus, son of Mary! Remember My favour unto thee and unto thy mother; how I strengthened thee with the Holy Spirit [al-Ruh al-Qudus], so that the Scripture and Wisdom and the Torah and the Gospel . . . and thou didst heal him who was born blind and the leper by My permission; and how thou didst raise the dead, by My permission" (Surah 5 Al-Ma'idah, The Table Spread: 110). "Go, O my sons, and ascertain concerning Joseph and his brother, and despair not the Spirit of Allah [Ruh-Allah]" (Surah 12, Joseph: 87). 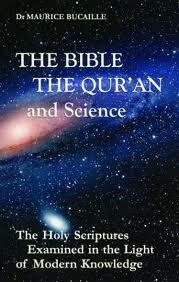 Note that the above quotations from the Qur'an make reference to God, to His Word, and to His Spirit. If one examines these references carefully, one could agree that the Qu'ran does indeed teach a belief in the Word of Allah, and the Spirit of Allah as well as in Allah the Almighty. "Some people have asked about the concept of Spirit in Islam, and there appear to be several views about this. Here, this concept will be examined using all references to it in the Quran. We may suppose that it refers to something very fundamental which cannot be explained in terms of anything else. It is by or comes by the command of Allah. It may refer to a fundamental force in the Universe which carries information or Truth, for Allah has created everything with his Word and with Truth. It is likely that the stage by stage condensation of the Spirit is responsible for all levels of the heavens and earths. The Spirit ascends into Heaven and descends into the earth. These two verses speak about two different cycles of events - there appears to be a spiritual circulation. (1) the change of person from the third to the second - he has become aware of himself. He has received some of the qualities of the creator. (2) Three faculties are mentioned - hearing, seeing and feeling. These should be understood as referring not just to outer senses, but to inner ones, in particular to conscience, consciousness and will. (3) that "small thanks" refers to ungratefulness - people do not act according to the spirit in them. The spirit has become dormant. (4) The possibility of resurrection is connected with the spirit. However, we have to distinguish Nafs (soul) from Ruh (spirit). Whereas the Spirit is a Universal principle, each person has his own soul and it can degenerate or it can be made to grow. Also 2:223,231, 3:25,30, 5:105, 6:12,20,70,164, 7:53, 9:42, 10:108, 11:21, 14:51, 20:15 and many more. The existence of the Spirit within man makes him a Vicegerent, a person who ought to be serving Allah, and exercising the faculties he has received on behalf of Allah. He was made as an instrument through which Allah can act more directly. "When thy Lord said unto the angels: Lo! I am about to place a Vicegerent in the earth, they said: Wilt Thou place therein one who will do harm therein and will shed blood, while we, we hymn Thy praise and sanctify Thee? He said: Surely I know that which ye know not. And He taught Adam all the Names, then showed them to the angels, saying: Inform me of the Names of these if ye are truthful. They said: Be glorified! We have no knowledge saving that which Thou hast taught us. Lo! Thou, only Thou, art the Knower, Wise." 2:30-32. Man, having been given some of the divine powers could act partly independently with his own initiative, creativity and sense of responsibility, though still dependent for these powers on Allah. This independence is not possible for the angels. In particular man was given the capacity to form concepts (the Names may also refer to the Attributes of Allah). It is this which gave him the power to do the evil and chaos which the angels feared, but Allah knew better. He could through experiences and trials lead them towards voluntary surrender. Here again we see that man is accused of not allowing it operate on behalf of God. This dormant spirit in man can be reactivated by the Messengers. These are persons who have already been chosen by Allah to be guided by the Spirit. "Lo! We inspire thee as We inspired Noah and the Prophets after him, as We inspired Abraham and Ishmael and Isaac and Jacob and the tribes, and Jesus and Job and Jonah and Aaron and Solomon, and as We imparted unto David the Psalms. And messengers We have mentioned unto thee before and messengers We have not mentioned unto thee; and Allah spake directly unto Moses." 5:163-164 and many other verses. Since, the Spirit is in all human beings, the Quran does not regard Jesus as being more than human. 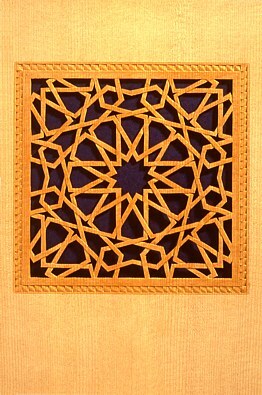 This is, of course, how Allah crated all things. 1. The Spirit is a Messenger from God, something which transmits truth. 2. The Spirit appeared in the form of a man. This appearance has been called Gabriel. Gabriel is said to be an Archangel made of spirit as angels are made of light and jinn of fire. 3. Jesus is the Messiah, and a Revelation for mankind which had been pre-ordained. He is a revelation in the same sense that the Quran is a revelation. This is, of course, how Allah introduced [His] Spirit into man. "Adi Shakti's Power is Divine, is described in every religion. Same in Islam called Ruh. In Bible is called the All-Pervading Power (Holy Spirit). it's called as [...] that cannot be seen; Niranjana, the One that is beyond any attachment... All these words are used for this Divine Power. People have heard about it; people have sung about it but unfortunately very few people felt it. And when they felt it they didn't know how to give it to others; how to make others feel it. So whatever they talked became sort of story or some nonsensical thing. Nobody could believe that they have felt anything like that or could imagine that there is such a Power really existing. Now luckily it has become quite a universal fact for all of you - that you know there is this Power. You are sure about this Power because you can feel it within yourself. And when you feel it you feel very joyous . . . the Power of Adi Shakti (Ruh of Allah) - She tells you the Truth." "The Primordial Mother was the Primordial Power of Divine Love. The Power of God separated from God itself. God was the Witness, Witness of the Play of the Divine Power. There is no difference between the two. God Almighty and His Power are just like the sun and his rays. For us, for human beings it is impossible to conceive the mystery. Moreover, in our ego, we think we can understand Him." 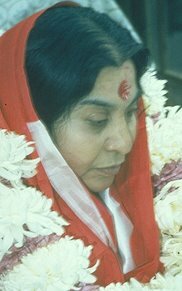 "The reflection of Adi Shakti (Ruh) within you is the Kundalini. Whatever is created on this Universe and in many Universes, is the work of the Adi Shakti. Now many people believe that there is one God-it's true, there's one God-God Almighty. But He has His own powers which he can embody into someone and can get His own manifestation expressed. So first of all He created the power of Adi Shakti. When it was created, then there was a sound, the sound that we call as OM - logos or anything you call it; the primordial sound - and these three powers came out of that sound, is aa, oo and ma [a, u, m]- om [aum]. The Adi Shakti is the one who embodies the desire of God Almighty. The desire of God Almighty comes out of His compassion and for His own expression, for His own manifestation, for His own reflection. I would say that He must be tired of loneliness so He must have thought of creating a partner who will manifest His desires. Thus, the power of God Almighty separated from Him and formed an embodiment of His compassion, His desire to create. They say in Sanskrit Chitvilas, the enjoyment of the Adi Shakti. Chit is attention. The attention has its own joy and to manifest that joy of our attention, She created all the universes, She created this Mother Earth, She created all this nature, She created all the animals, She created all the human beings and She created all the Sahaja Yogis. This is how the whole creation has worked out. This is the single biggest misconception that people have made which helped distort the issue of 'who we are'. Also, when they speak about someone dying, the say: 'his Rouh has left him'. So, if the 'Soul' is the 'Nafs', then what is the Rouh? It becomes apparent to the reader that the 'Rouh' is from GOD and it is the accumulation of 'knowledge' that will assist the human being in his life...It is best described as 'Spirit'. You see, animals also have 'Nafs' just like we do (it is their life-force), yet, you do not see monkeys building spaceships nor turtles working on computers! The 'Rouh' is the gift that GOD gave to our species to allow us the advantage of 'knowledge'. All animals can communicate with one another (remember the birds speaking to Solomon?). However, it is only man that has 'knowledge'. The 'Rouh' is GOD's gift to us, and it is only GOOD. The information that the 'Rouh' provides each of us is to be used for our benefit, but we have the 'choice' to use it for evil (like nuclear fission being used to make a bomb). Some unfortunate news about the 'Rouh': It will NEVER approach you and save the day. for example, you are struggling to understand something. If you don't ask GOD for help, it won't go; "hey, here is the answer!" no, you have to approach it. Also, it will always be LITERAL. you will have to be specific of what you are asking. Note, you don't have to say this out loud. You can just think of it - because many times, humans have hard time expressing what exactly they want to ask. With the spirit of god, you don't have to worry about this - as long as you get the intention of asking, the spirit will know the question...as much as you wanted to ask and that ALONE (though it knows all the questions you know - it is not going to answer anything you did not ask). Thus if we can summarize what we have upto this point. 2. The 'Spirit' - Rouh (this is a gift from GOD, it is NOT yours, you do not own it, all people have access to it - like the Quran. it's purpose is to help provide answers and knowledge to help your Soul make the right decisions). . . . The best Islam is within you - the spirit of GOD (Rouh'u Allah) is within you. There is no such thing that truth lies outside of you. the ultimate truth lies within you. please, take advantage of that blessing. It will be your ultimate weapon against falsehood." "By the token of time (through the Ages), man is in a state of loss, except those who truly believe, act correctly and act together in mutual counsel of Truth and patience' (Al - Asr 103). In inviting people to goodness and forbidding from the wrong, Muslims will need to join hands with other believers who share a great deal of these values about good and bad and about right and wrong. The conflicts that we witness today are not conflicts between religions, they are conflicts of irreligion. Therefore, those who believe in God and know the right from the wrong - Jews, Christians and Muslims, especially - can join together to build a not a perfect, but an incomparably better world than we live in today: a society of neighbors who are just and fair to each other. The mission of God's Messenger of the Covenant is to confirm existing scriptures, purify them, and consolidate them into one divine message. The Quran states that such a messenger is charged with restoring God's message to its pristine purity, to lead the righteous believers - Jews, Christians, Muslims, Buddhists, Sikhs, Hindus, and others - out of darkness into the light (5:19 & 65:11)."